"Newcastle City Council is currently working in partnership with various organisations across the city to develop a scheme called RNIB React. RNIB React is a talking sign system that helps people who are blind and partially sighted find their way around town centres, safely and independently. Speaker units have been set up on a chosen route around Newcastle City Centre. 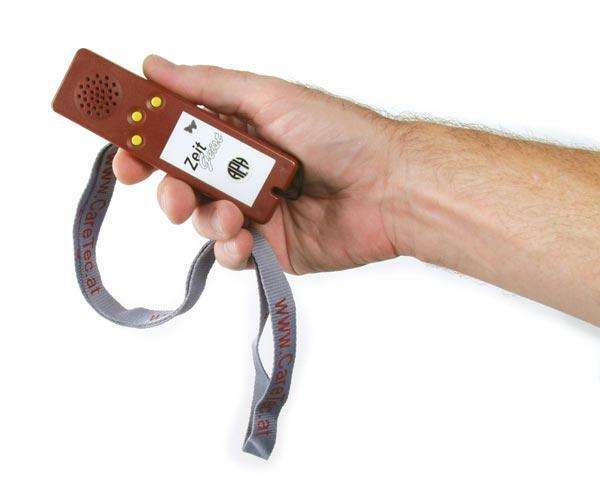 Users carry a small fob device, which triggers the unit to announce a message when within range. 17 units have been installed in the city centre. They are located on Northumberland Street, Blackett Street, Percy Street and St Thomas Street. There are further units located within metro stations and leading to the RVI Hospital." A new facility to help blind and visually impaired people navigate their way around the heart of Birmingham city centre [UK] will be launched in Spring [Northern hemisphere] 2006. The 60 Wayfinder units will be installed around the city centre, providing users with practical audible information, to confirm their location and assist them to reach their destination safely. Most units are being installed on existing street furniture to minimise street clutter and, where no street furniture exists, being fixed into new purpose built stainless steel posts located at the back of footways. Users will carry a trigger card to activate the speaker unit when within range. Details on how and where to obtain the triggers will be available shortly. Users of this system are able to hear recorded navigational information through the use of auditory signposts. Users scan the signposts with trigger cards that presumably access the system through some sort of wireless technology (Bluetooth etc. ).